All4Israel - On Armon Hanatziv (East Talpiot) in southern Jerusalem. On Armon Hanatziv (East Talpiot) in southern Jerusalem. 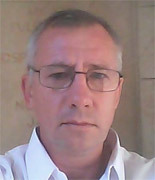 Oct 13, 2015 - Alon Andrei Govberg, 51, of Jerusalem was killed in a combined shooting and stabbing attack on Egged bus 78 in the neighborhood of Armon Hanatziv (East Talpiot) in southern Jerusalem. Alon was born in Baku, Azerbaijan, from where he immigrated to Israel about 20 year years ago. Unmarried and with no close family in Israel, he lived alone in the East Talpiot neighborhood of Jerusalem and worked with the Andalus Orchestra. He was critically wounded in the attack and died of his wounds in the hospital. Alon Govberg will be buried in the Givat Shaul cemetery in Jerusalem. He is survived by his elderly mother and aunt.